I used to be so good about meeting my daily water quota. Unfortunately, with the baby came a pretty significant increase in caffeinated beverages in my house—coffee, diet soda, anything that will give a much needed (if short-lived) boost when I’m tired beyond belief. But I’m well aware that pumping caffeine straight into my veins is not the best for me or anyone, really (try these tips for sleep deprivation instead!). So I’ve actually been trying to get my water on a bit more regularly. 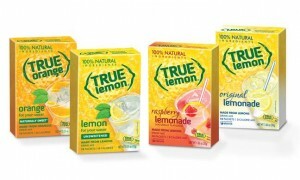 Luckily for me, True Citrus sent me some True Lemon products to fun-up my H2O and get a little more citrus in my life. They’re made from fruit, so there aren’t any scary ingredients to contend with here, and they’re even a good source of vitamin C.